The Open Science Collaboration has completed 100 replication studies of findings published in the scientific literature, and the results are available. The replicated studies have become much more likely to be true, but we are left with some questions about what it means that many studies did not replicate. This is a very rich dataset, and although there can be many reasons a finding does not replicate, I wanted to examine one concern. Studies in the Reproducibility Project were well powered for the effect sizes observed in the original studies. But we know effect sizes in the published literature are often overestimated. So is it possible that most of the replication studies that did not yield significant actually examined much smaller effects, and thus lacked power? The table below (from the article in Science) summarizes some of the results. There is a nice range of interpretations (even though I'll focus a lot on the p < 0.05 criterium in this post). The probability of observing a statistically significant effect, if there is an effect to be found, depends on the statistical power of a study. The ‘average replication power’ provides estimates of the statistical power of the studies, assuming the effect size estimate in the original study was exactly the true effect size. With 35 significant effects out of 89, we get a 40% replication rate. But we have very good reasons to believe that not all original effect sizes were accurately estimated, and that the average power of replications was lower (Shravan Vasishth called this 'power inflation' earlier today). And when the average power is lower, less findings are expected to replicate, which means the replication success is relatively higher (i.e., instead of 35 out of 89, 35 out of some number lower than 89 replicated). 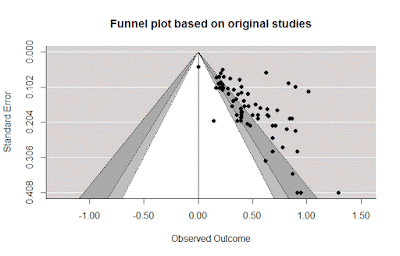 A contour-enhanced funnel plot makes it more strikingly clear that almost all original studies observed a statistically significant effect. This is surprising, given that sample sizes were much smaller than in replication attempts (and the replication studies had 92% power, based on the original effect sizes). 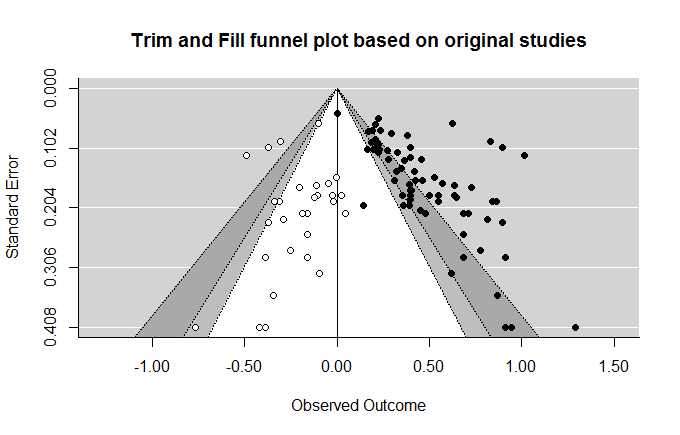 This is also clear from the distribution of the effects – small studies (with large standard errors, on the bottom of the plot) have large effect sizes (because otherwise they would not be statistically significant), while larger studies (at the top) have smaller effect sizes (but still just large enough to be statistically significant, or fall outside of the white triangle). 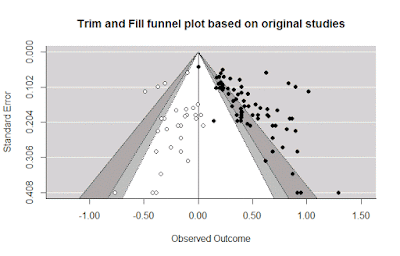 Trim-and-fill analysis can only be used as a sensitivity analysis (it does not provide accurate effect sizes or estimates of the actual number of missing studies), but it clearly shows studies are missing (there are 29 white dots in the trim-and-fill funnel plot, which represent the studies assumed to be missing), and reports a meta-analytic effect size estimate of r = 0.28 (instead of r = 0.42) based on these hypothetical missing studies. 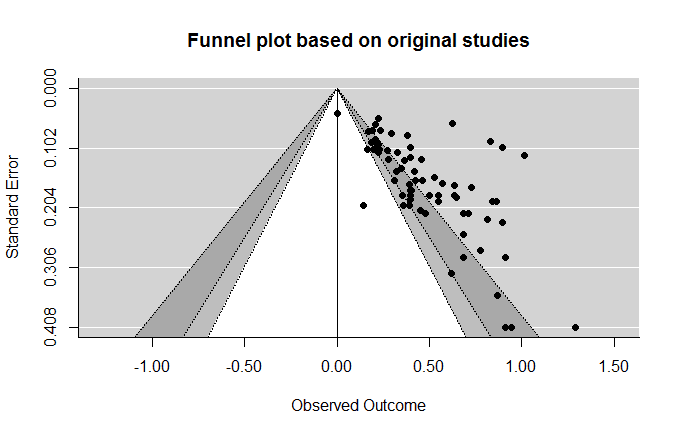 This does not mean r = 0.28 is the true effect size, but it’s probably close (a meta-analysis of meta-analyses estimated the average effect size in psychology at r = 0.21 – so that we might be in the ballpark). The difference between the biased and unbiased effect size is substantial, and this means power could very reasonable be somewhat lower that 0.92. 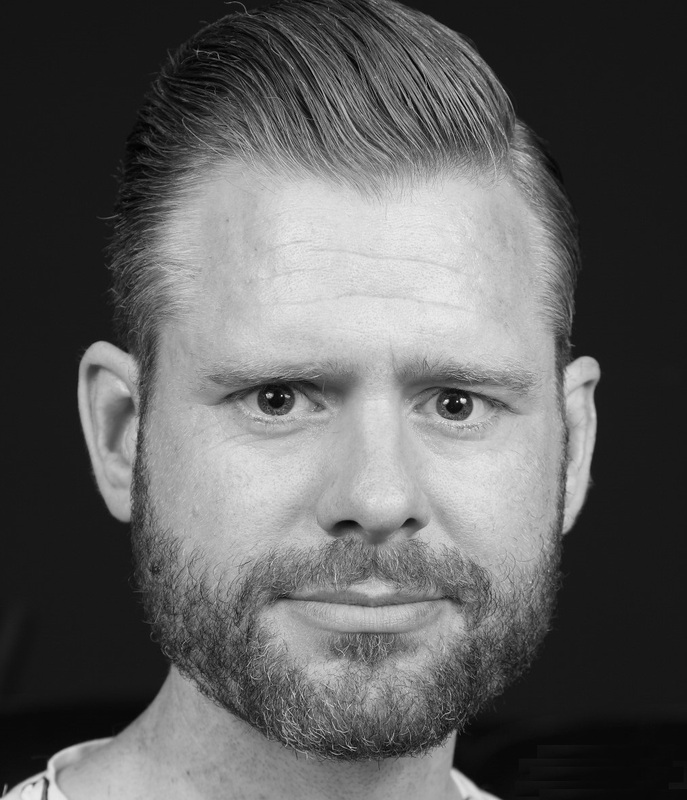 There’s not much the Reproducibility Project could do about publication bias (e.g., there are no full-proof statistical technique to estimate unbiased effect size estimates). The solution should come from us: We should publish all our effects, regardless of their significance level. If we don’t, we are sabotaging cumulative science. 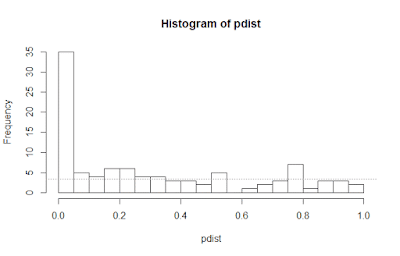 The histogram is divided into 20 bins, and the frequency of p-values in each bin are plotted. 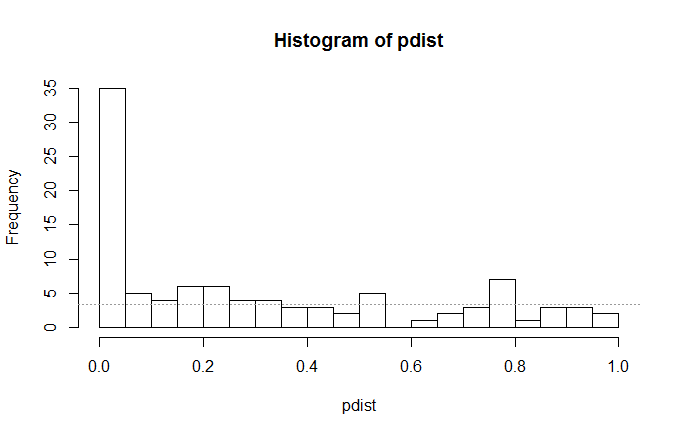 This means all significant results (p < 0.05) fall in the left-most bin. 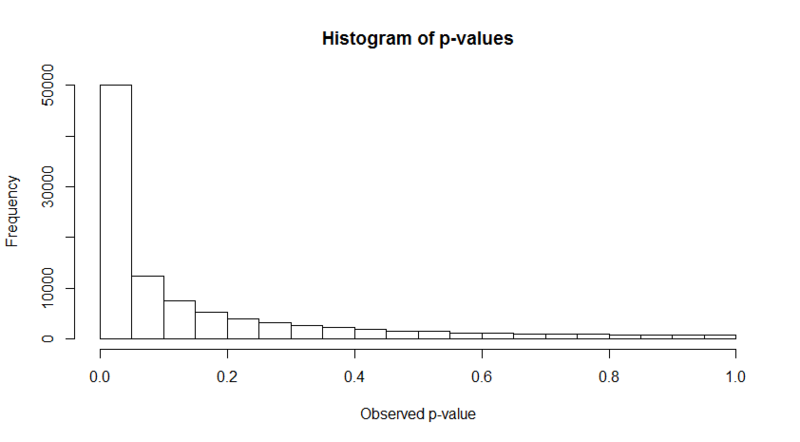 If all non-significant studies examined no true effects, the p-values would be uniformly distributed, with 3.4 studies in each bin (64 non-significant studies (there are 99 p-values plotted, so 99-35=64) in 19 remaining bins). If we think of this p-value distribution as a mix of null effects (uniformly distributed) and true effects (a skewed distribution highest at low p-values), the distribution is not a shallow curve (which would be a sign of low power, see p-value distributions as a function of power here). Instead, the distribution looks more like a sharp angle, which mirrors a p-value distribution from a set of highly powered experiments. It really looks like our power was very high (but we should remember we only have 100 datapoints). There will certainly be some replication studies that, with a much larger sample size, will reveal an effect. In general, it is extremely difficult (and requires huge sample sizes) to distinguish between a real but very small effect, and no effect. But at least the distribution of p-values takes away the concern I had when I started this blog post that the biased effect size estimates in the original studies affected the power in the replication studies.